Darren Byers has been building furniture and working with wood for over twenty years. For the past twelve years he has been sculpting and woodcarving. Darren Byers’ sculptures are located in the United States, Canada and Europe.As well selected works can be seen at Starving Artist Cafe/ Gallery. For the past six years Fred Harrison & Darren Byers have been working together to create large scale bronze sculptures. 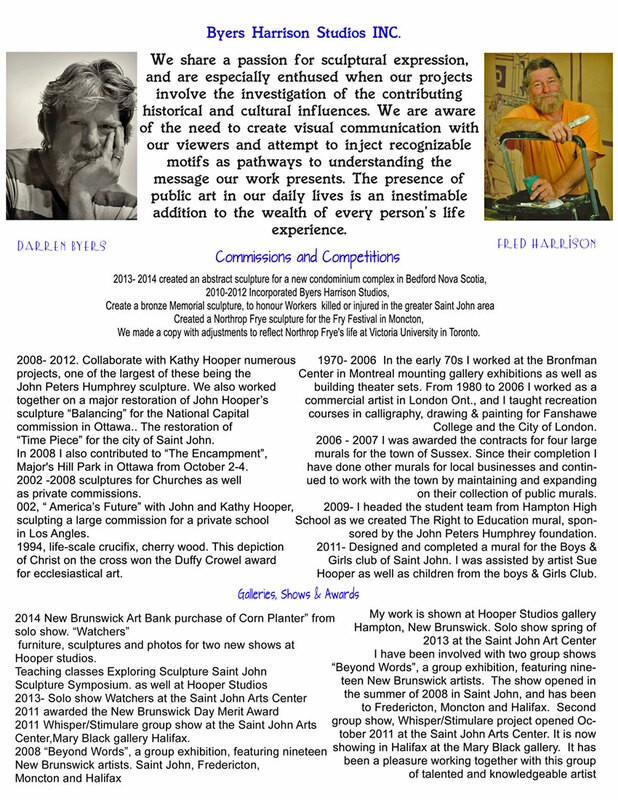 They started there corporation Byers Harrison Studios INC. and have been exploring new adventures ever since. Both artists are still involved in their individual artistic pursuits when they are not collaborating together on a commission. You can also visit the studio by chance or appointment. My education of wood began while working in my father’s woodworking shop at the age of sixteen. I was exposed to the wonders of working with raw materials and transforming these fragments into a functional piece of furniture. For over thirty years I have continued to learn the secrets that lie within the grains of wood and search for the next piece of living history to be used in my sculpture. I enjoy discovering the unexpected in the expected, asking questions and exploring new things that challenge and excite me. I consider sculpture as a puzzle, with its many pieces fitting together to create the story I want to share. Are the hands clinched or relaxed? Is the head tilted or held straight, slightly upward? The ever telling eyes or the curl of a lip, all of these when put together create the whole piece and the potential to relate that story to the viewer. I am a visual problem solver who invites the challenges of working with various materials; this often leads to new and exciting developments that keep me learning as an artist. I continue to work on private and public commissions, enjoying the freedom this life offers me to enjoy time with family and friends, to help within my community, contemplate life and react to what I feel passionate about.